Lindsay Jay is an International Fitness Presenter specialising in body conditioning, yoga and Zumba® fitness. Lindsay has featured on a number of media channels, including BBC One The Apprentice, Fitness TV and ITV’s breakfast show This Morning, Vogue. She is featured monthly in Women’s Fitness magazine and her You Tube channel has attracted over 60 million views. 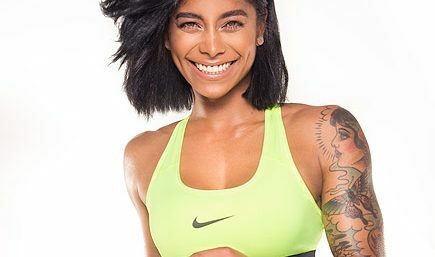 As a sports model, she has worked with brands such as Reebok, Adidas and Nike and as a fitness presenter Lindsay has taught at fitness conventions across Europe and the US and teaches weekly classes live streamed on the internet at instructorlive.com. Lindsay says on her website www.lindsayjay.co.uk: “ Healthy living is all about stimulating your mind, body and heart. This philosophy drives me and is the source of my passion. My aim is always to ensure that you leave my workouts feeling positive and inspired, whether you’re calmly centred after yoga, buzzing with the endorphin rush after a PT session or grinning with exhilaration after a great Zumba® dance class. I started off working in the performing arts industry and really enjoyed it, but found that I wanted something more mentally and physically stimulating, something worthwhile and with a sense of purpose. I have a strong desire to help and encourage others to realise their full potential, so fitness teaching was the perfect answer. We are all capable of so much, but at times it can be difficult to achieve on our own. However, with a good helping of positive encouragement and a little perseverance, anything is possible. I love seeing the look of pleasure and excitement on my clients’ faces when they realise that reaching their goal is not only achievable but actually enjoyable! That’s what Lindsay Jay Fitness is all about ”. Lindsay Jay is an exceptionally talented fitness trainer and sports model. She is in conversation with Namita Nayyar, President Women Fitness. Ms. Namita Nayyar: Tell us about the journey that took you to the top of the world of fitness training? Ms. Lindsay Jay: It’s been really quick! I’ve always been into the Arts and fitness training gave me an opportunity to share my passion whilst helping other people, which I find extremely fulfilling. Ms. Namita Nayyar: How has your experience and background of working in the performing arts industry helped you in your present profession of Fitness Trainer, Fitness Expert and Fitness Model? Ms. Lindsay Jay: My education in Dance, Theatre and Film gave me the confidence to teach big convention classes and to know what photographers or camera people were looking for during shoots. Ms. Namita Nayyar: Share your exercise routine that you do to maintain such a bikini perfect physique? Ms. Namita Nayyar: What is your diet? Do you take a particular fixed regulated diet comprising of nutrients and vitamins to keep you in perfect health? Ms. Lindsay Jay: My diet is really dictated by my lifestyle, here in Ibiza there is very little ‘convenience food’ so we tend to cook good local produce. My close friend Bridget Hunt created a sugar freeing nutrition plan called ‘Six Pack Chick’, http://www.sixpackchick.com/ this is really good if you need to shock yourself out of our sugary world.